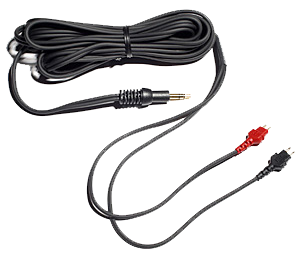 There are many instances in headphone-dom when a headphone has potential that may not have been fully realized by the manufacturer. 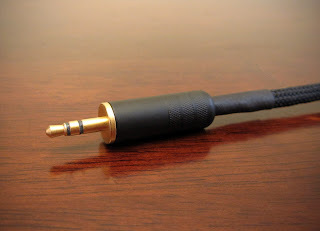 It's then that the trusty headphone modder wields his magical dremel and goes to work for the good of the audiophile community. Just that has happened with the Fostex T50RP headphones. 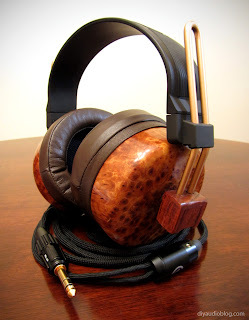 Fostex is a Japanese company really known for their specialty drivers (especially full range) and they have some clout in the pro audio industry as well. 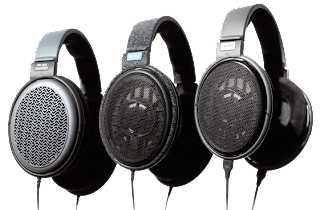 The T50RP are the flagship model of the Fostex RP lineup (consisting of the T20RP, T30RP and T50RP). Flagship may sound expensive if you're familiar with headphone manufacturers like Sennheiser, Grado or Sony, but these are only $80 or so. An $80 headphone from a company not really known for their headphones may seem kinda humdrum, but the driver housed in the headphone is fairly unique. From the Fostex site: "The newly developed RP Diaphragm improves the overall frequency response ... employing copper foil etched on a polyimide film Neodymium magnet for high sensitivity and excellent transient handling." Bottom line for those who just glazed over, this is an orthodynamic headphone and a smidge cheaper it's ortho-cousins: the HiFiMan HE-5LE ($699) or the Audeze LCD-2 ($945). 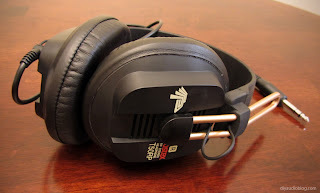 HeadFier Smeggy took it upon himself to extract the best the Fostex T50RP could deliver, removing them from the shackles of under-damped plastic cups and vinyl pads, creating something that would be forever known as the Thunderpants. 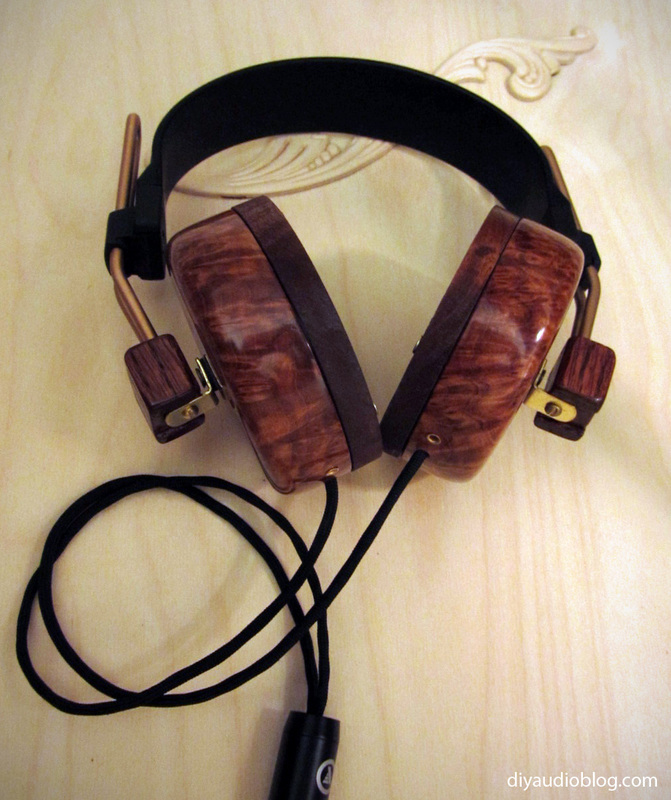 Smeggy (aka Gary) removes the driver from the headphones and installs it in a well-sealed ported wood enclosure, replaces the pads and cable, installs a leather headband and does a few other tweaks. So how does a modified T50RP sound? I have no idea; I'm going to try and build one to find out. 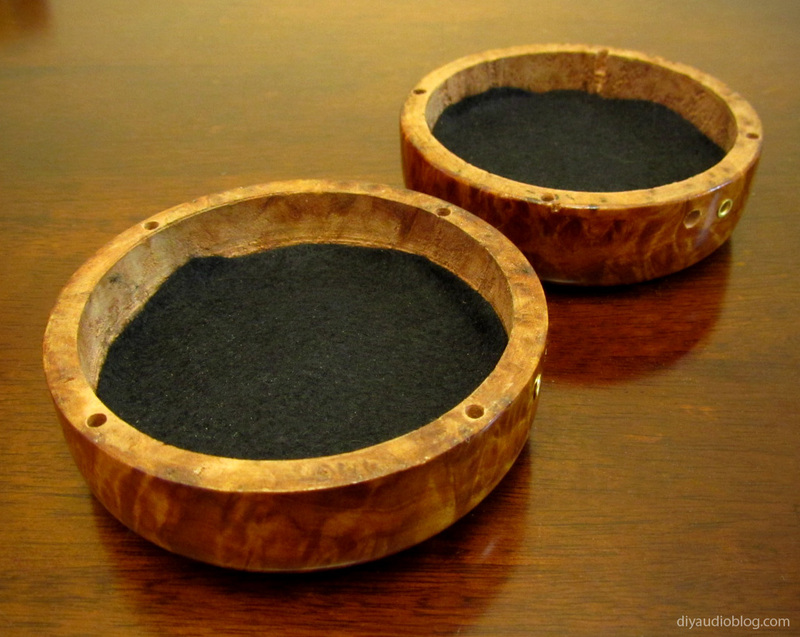 My first modus operandi was to locate a set of pretty wood cups that would house the drivers. 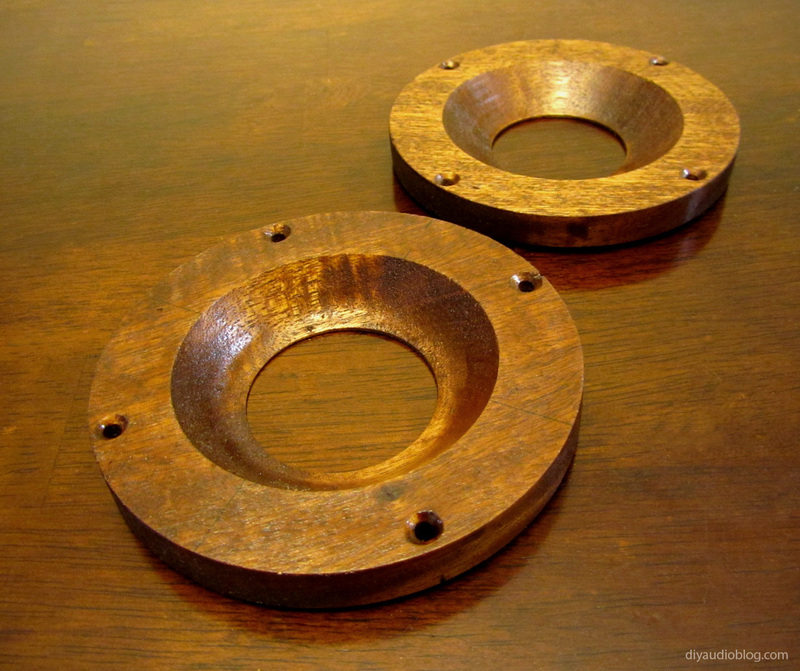 I turned to a wood turner on HeadFi and commissioned him to build me the cups and baffles as I don't have a lathe to handle such delicate work (for the sake of privacy I won't be providing his contact information at this time). 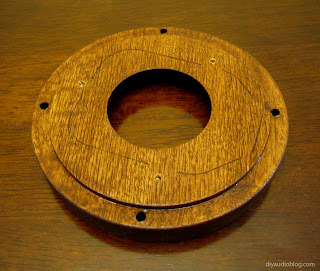 The first easy bit of work would be to trim a pair of felt circles to drop in the wood cups to prevent sound reverberations and hammer in a pair of brass fittings into the bottom port on the cups. 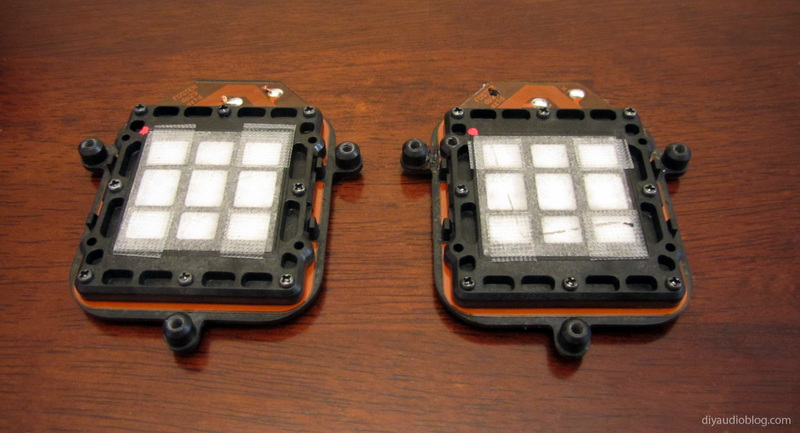 I went ahead and did some depth mounting for the screws on the baffles so the pads would sit flat across them. 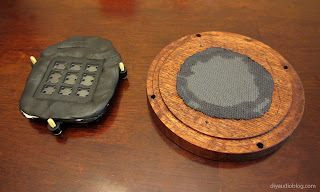 They were then sealed, stained and poly-coated, even though they wouldn't be seen once the pads were in place. If anything, it would help preserve the wood and prevent the rough finish from wearing against the pads. 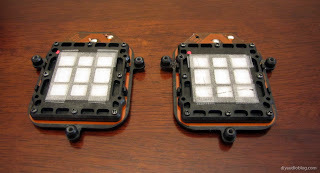 The drivers from the stock T50RP need to be removed, which is about as simple as unscrewing a few screws after removing the pads and snipping the two wires running to the unit. At the recommendation of Sachu, who has also heavily modified his T50RPs, porous tape was applied to the four corner quadrants on the back of the driver. The three plastic screw-holders around the frame were then drilled out and tapped for #4 screws so they could be screwed directly to the new wood baffles. There's a bit of a gap between the drivers and the baffles that will need to be sealed, to minimize this gap, a piece of Dynamat Xtreme was trimmed and smoothed to fit around the driver opening. Now the baffles will be prepped to accept the drivers. Small holes were drilled to accept the #4 screws and an outline drawn to see where the caulking would need to be. 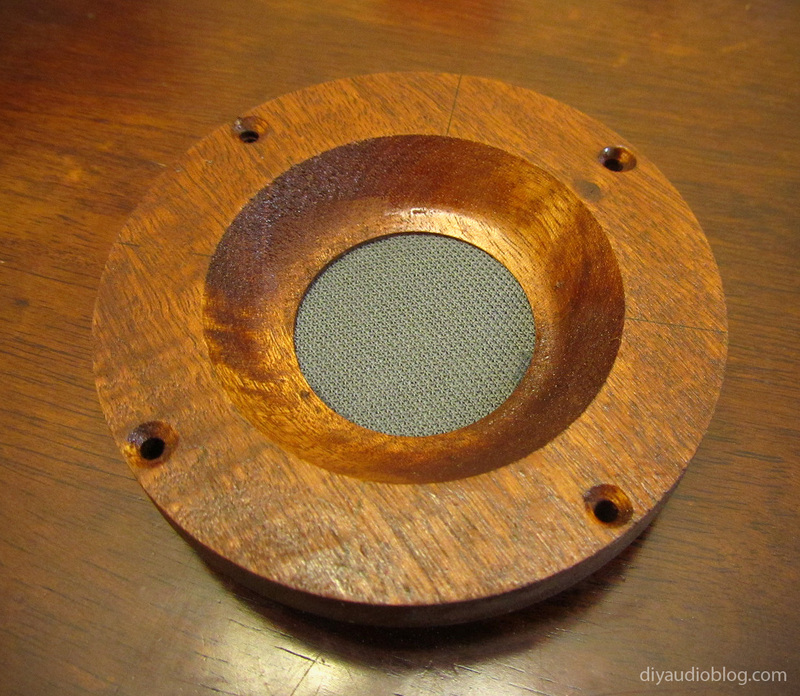 I elected to add a bit of speaker grill fabric from PartsExpress to separate the driver from the ear, adding a modicum of comfort and perhaps softening the higher frequencies. The driver surrounds were loaded with speaker caulking (also available at PartsExpress), which is a rubber sealant that performs a bit like blu-tack. This will seal the driver to the baffle. The drivers are then carefully lined up with the pre-drilled holes on the baffle and screwed in place. The speaker caulk is smoothed around the edge to ensure it's air-tight. Next comes the point where the driver cups are fastened to the headband. Since the original hardware can't be used with the wood cups, new hardware has to be fashioned. I offered Smeggy to purchase a set of his hardware as he does such a nice job with it, but he seems to be tied down with popularity at the moment. So that leaves it up to me. 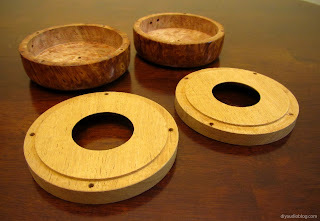 The first requirement is a piece that will attach the wood block to the wood cups. Shelf brackets were procured from Home Depot, which were then dremelled, drilled and the holes depth mounted. 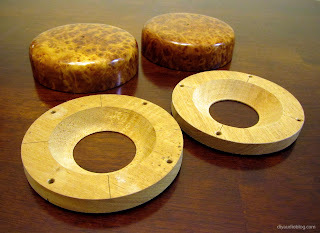 Next came the creation of the wood blocks that would act as a pivoting joint between the cups and the headband. The blocks were cut from a spare piece of Red Oak from Home Depot using a jigsaw, then sanded down by hand and the small concave area on the bottom was created using a Dremel sanding wheel at a nice slow setting. The holes were trimmed out on the drill press. 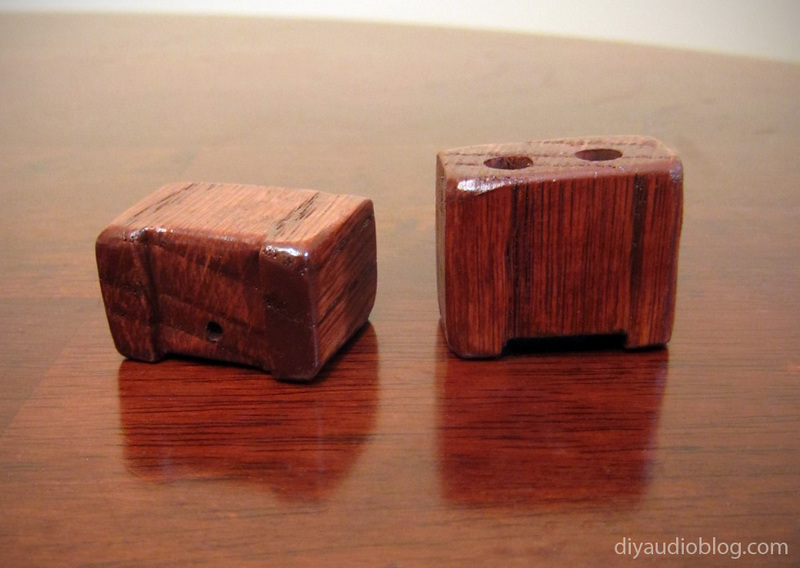 Once satisfied with the shape, two coats of oil-based stain were brushed on, then two coats of satin polyurethane. The small hole on the bottom was then threaded for a size six screw. 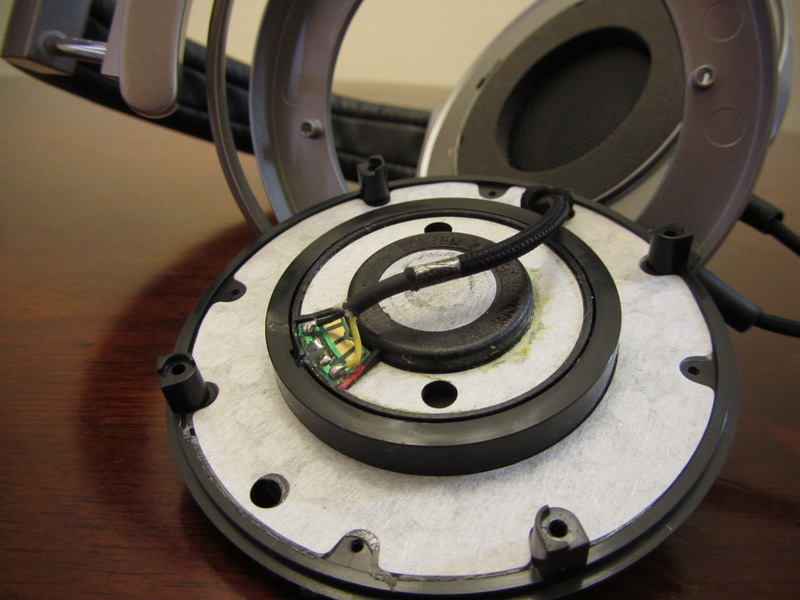 Finally, the headphone could begin to be put together. 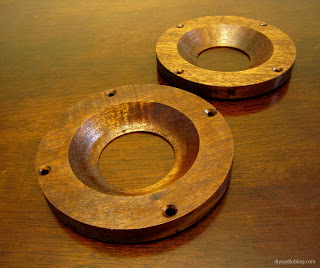 Loctite Adhesive was used to ensure the copper colored pipes wouldn't ever slip out of the wood blocks. 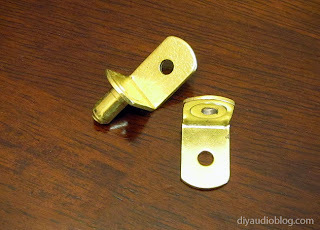 The gold shelf brackets were screwed to the blocks firmly, but not overly so, as the cups would need the ability to be pivoted back and forth at slight angles. 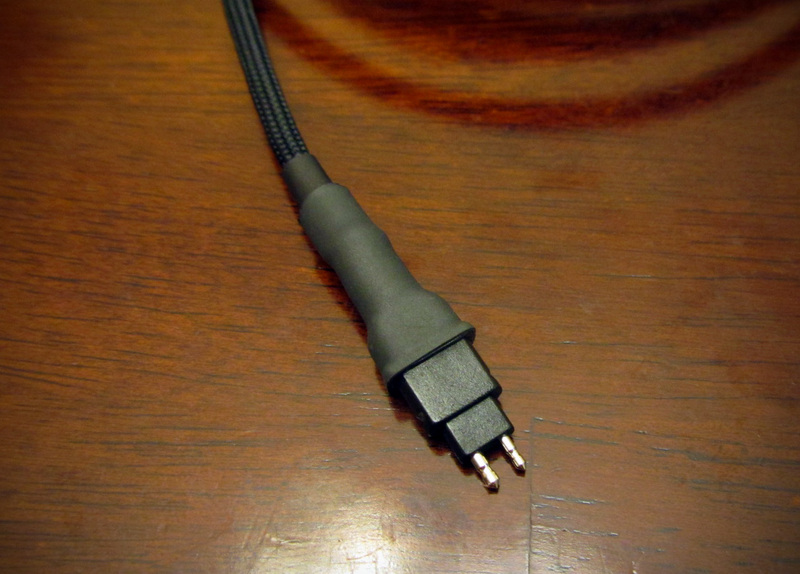 Now the cable could be soldered to the driver. 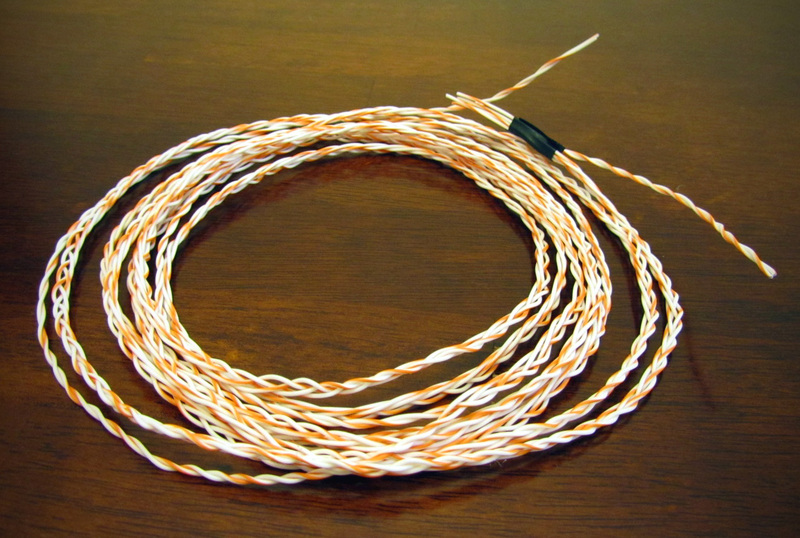 I prepared a nice high-quality Zynsonix Vray Prime cable made with Cardas copper for the T50RPs. 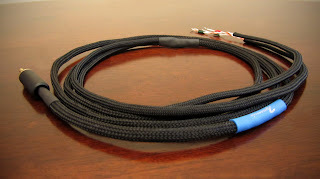 The wire was sleeved with soft black nylon multifilament and terminated with a Furutech FP-704G 1/4" TRS connector and the "Y" split covered with a sleek ViaBlue cover. This was run through the cups and soldered to the terminals. Speaker caulking was then placed where the baffle and cups would come together for sealing purposes, along with the area where the cable enters the cups. Wires are held with a zip-ties as a strain relief system; simple but effective. The baffles were then screwed in place with four wood screws each. Care must be taken when screwing into wood as it can strip easily. 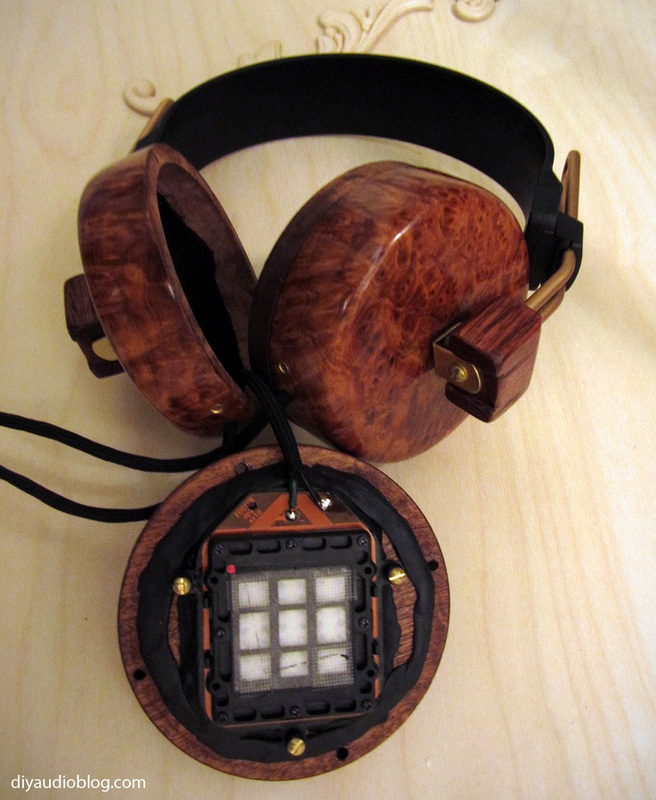 All that's left is to fit the super expensive Stax Omega II pads and we have a finished headphone! 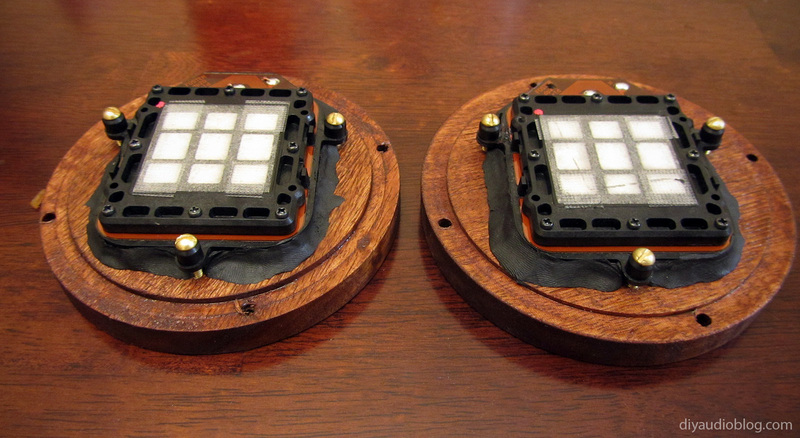 So, now that they are complete, it begs the question; "how do they sound?" I was actually quite surprised with the quality, given that this headphone started its life as an $80 set of cans. 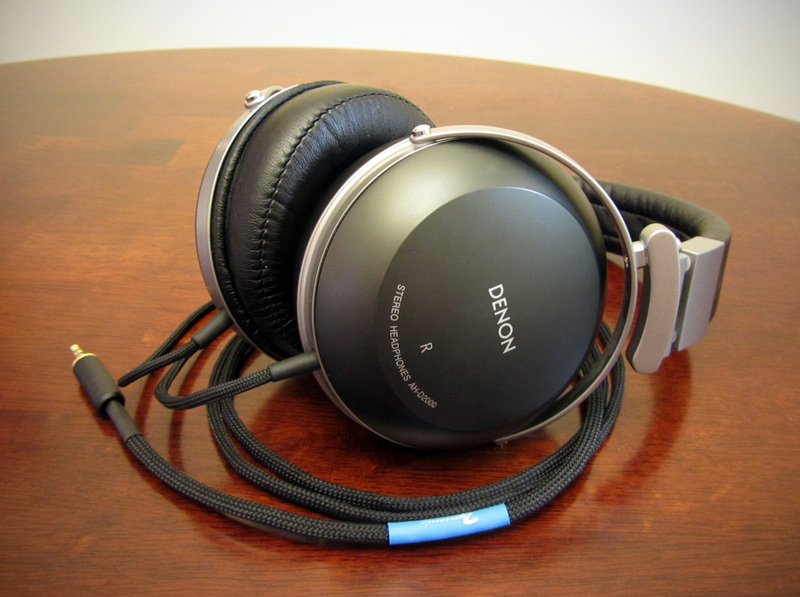 It can easily hold its own against some of the nicer dynamic cans like the Denon D7000. 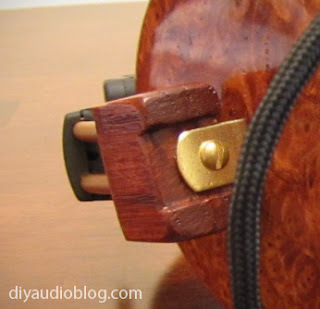 The bass is tight and articulate, the treble very informative but not harsh, and the whole dynamic range has a nice overall clarity that is almost reminiscent of an electrostatic headphone. I would agree with all that I've heard regarding the seal of the headphones. The cups need to be cupping your ears evenly for the best sound. I wish I was able to compare it to the HiFiMan or Audeze headphones, but I haven't been able to audition either as of yet. All in due time. 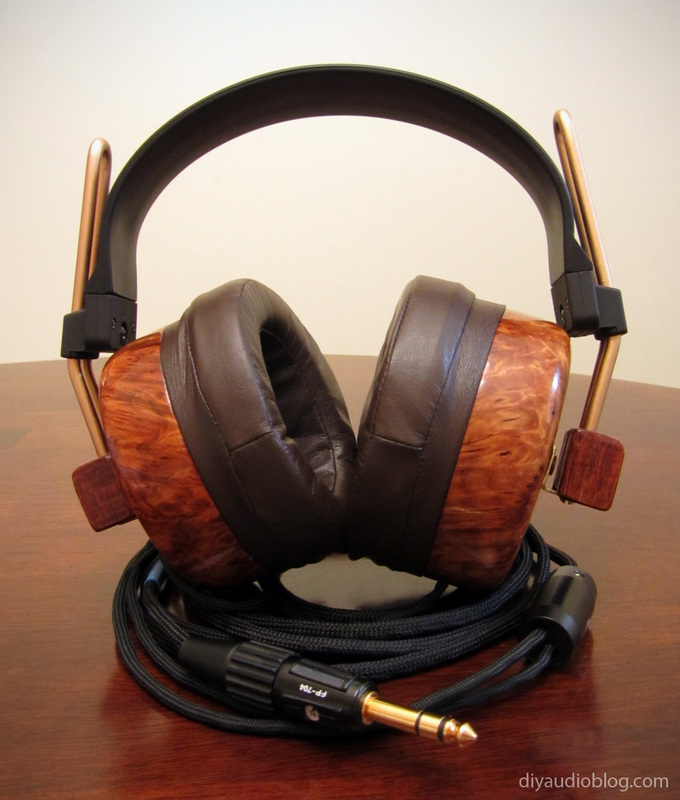 If you're looking to have your Fostex T-50RPs recabled or damped, or any other headphone, give Zynsonix Audio a shout. Sennheiser, a family-owned audio electronics company founded in Germany in 1945 is one of the most famous headphone manufactures today. With over 100 different headphones on their site as of this writing, it seems like Sennheiser has a headphone for nearly every budget and every purpose. I would contend that the HD580, HD600 and HD650 trio of headphones are Sennheiser's main staple in the current audiophile headphone landscape. 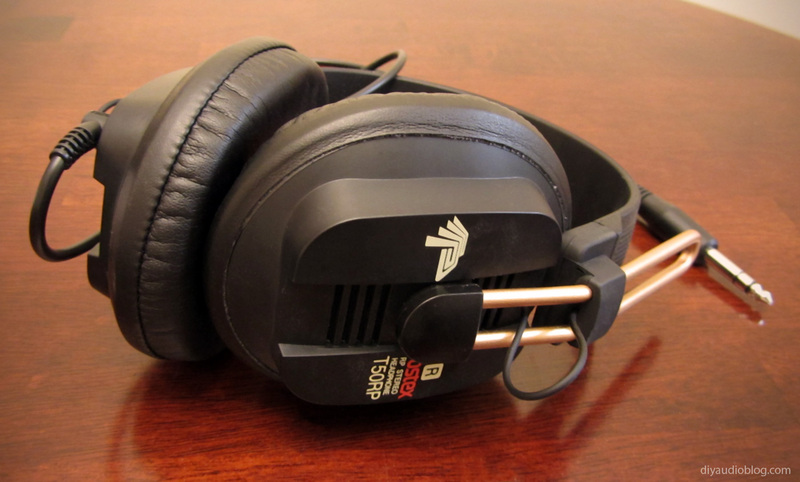 The HD580 really put Sennheiser on the audiophile map back in the spring of 1993, one only has to read Wes Philips of Stereophile's review to see why. Three years later, the company would release the HD600, which was based on the special edition HD580 Jubilee made with carbon fiber and a more free-flowing grill. Finally in 2003, the HD650 was released, which presents what I feel is a more warm and full sounding presentation than the previous two headphones. One unique feature of the HD580-650 trio of headphones is the user-replaceable cable. One would imagine that this feature was initially implemented just in case a listener mistakenly rolled over their cable with a chair and needed to replace it without sending it back to the factory. What this (possibly inadvertently) led to was cable manufactures building their own unique high-quality cables to improve the sound of the headphone. Sennheiser headphones and their corresponding cables have a proprietary pin and spring system to transfer the signal from the cable to the driver. 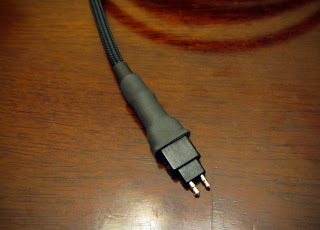 Each side of the cable has two pins, one large one for ground and a smaller one for signal. These are inserted into the headphone and a small spring within the cup conducts the signal and sends it along some very thin wires to the driver. Early on, the only way to get these pins was to use an existing Sennheiser cable as a donor. I cut though countless Senn cables and used a dremel to trim into the plug to gain access to the pins. 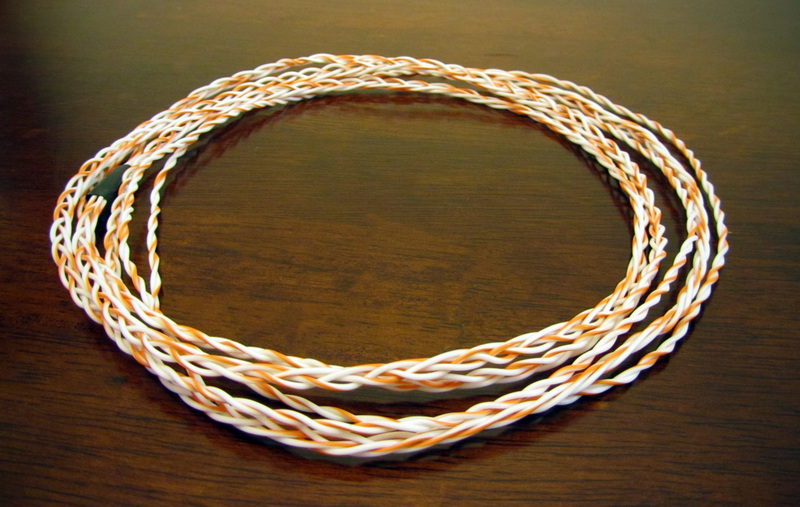 Once the cable was soldered in place, a number of layers of epoxy and heatshrink were used to make sure it stayed in place. Now-a-days, we have it easy; Cardas manufactures rhodium plated Sennheiser connectors so users can make their own cables with relative ease. At a suggested retail of $16 (as of this writing), they are quite a bargain. 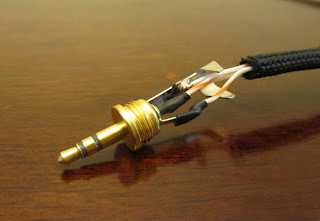 Below I will detail a few of the steps required to make a Sennheiser headphone cable using these wondrous little connectors. 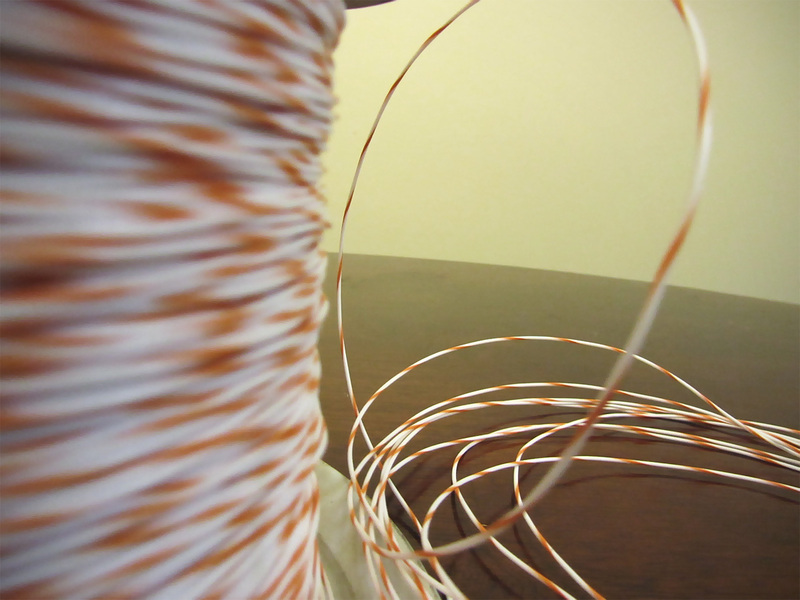 As nearly every cable starts at Zynsonix, a number of runs are measured and cut from a spool of wire. In this case, four wires are trimmed. 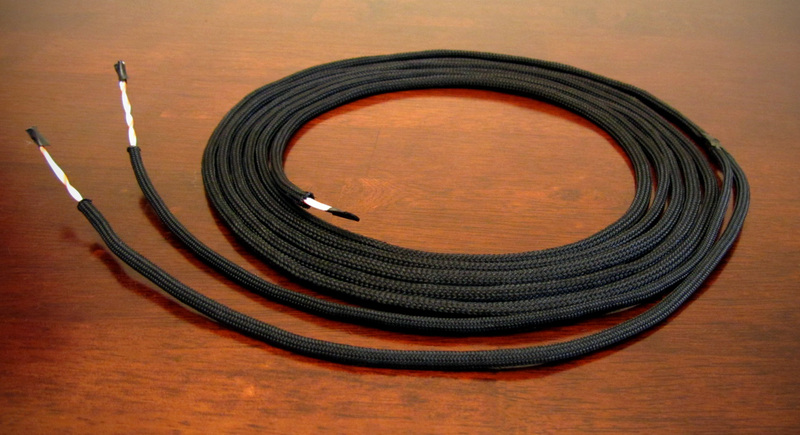 This cable will be approximately 10 feet, but this does not incorporate the wire lost during the braiding process. Because of this, the wire needs to be measured longer and trimmed down after the braiding process to the size needed. This cable is braided in litz style to help maintain cable geometry over the whole length and can help reject EMI / RFI. The braid can be done tightly or loosely depending on preference. 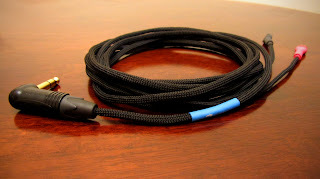 At the "Y" split of the cable where it separates to go to each of the Sennheiser earcups, the braid is converted to two separate twisted pairs. After this process is complete, the cable is sleeved, in this case with non-microphonic soft black nylon multifilament. This sleeving requires a hot knife so that it doesn't fray after being cut. I also take the time to melt the sleeving together at the "Y" split to ensure it stays together after many hours of use. 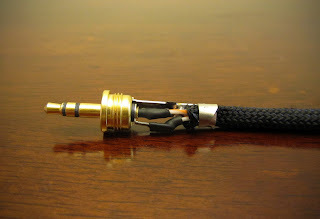 Now comes the point where the connectors need to be soldered to the individual wires, beginning with the Cardas Sennheiser connectors. These connectors are rhodium plated, which means they require a decent amount of heat to set the solder properly, however the surrounding material melts very easily. The wire fits into the concave inlet on the inside of the pin. I personally prefer to tin the wire first, then use quick spurts of very high heat and solder to achieve a good connection. As stated before, the large pin is the ground connection and the small pin is the signal. 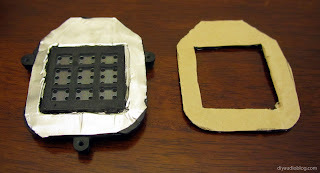 Once the connectors have been soldered securely, a bit of epoxy is used to fill in the open area on the connector. Once dry, 2-3 layers of heatshrink are used to protect the area and act as additional strain relief. 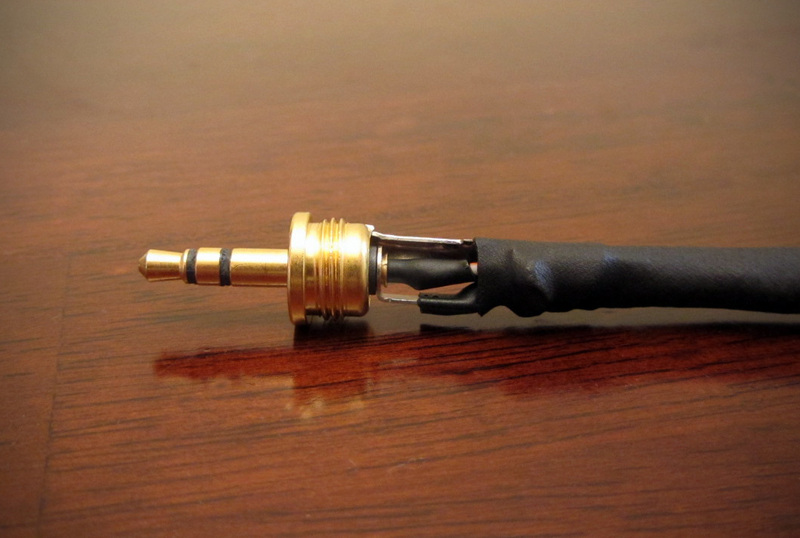 This particular cable was going to be used with Bottlehead equipment, so the user requested a right angle 1/4" plug. 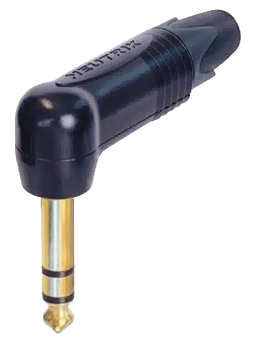 For this the high quality Neutrik NP3RX-B was selected, which is gold plated and has a black case for sleek looks. 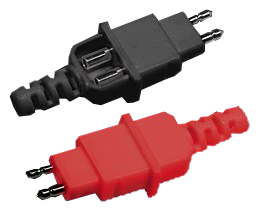 My numerous years of DIY have led me to find that Neutrik makes some of the most robust 1/4" connectors on the market, and are likely the best value out there. If one is willing to spend extra though, the $20 nearly tank-proof Furutech FP-704 may be worth looking into. Now that these items are soldered in place, the cable is complete. 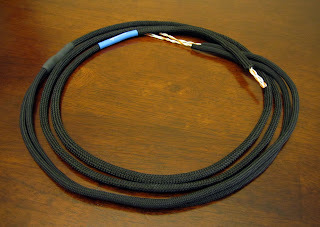 Below is the final Zynsonix Xev Sennheiser cable. 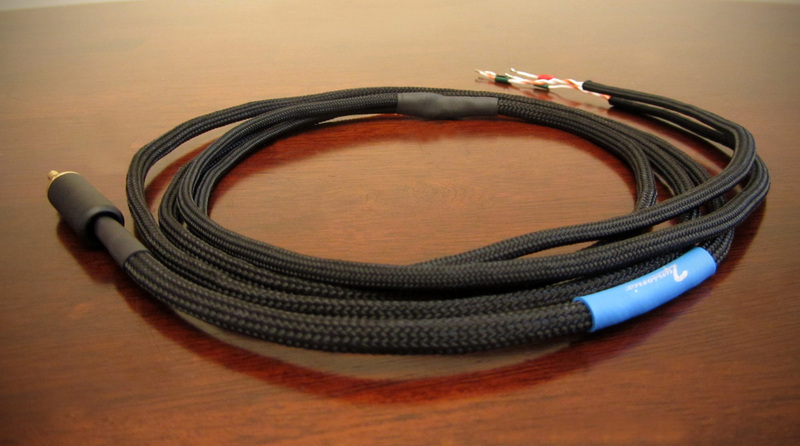 Zynsonix is offering custom Sennheiser HD580, HD600 and HD650 headphone cables and recables for many other headphones. 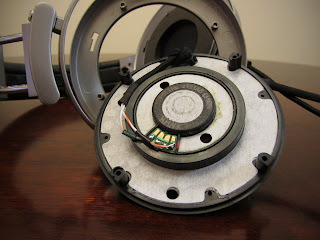 Zynsonix can transform your headphones for a very reasonable price, please contact us for a quick quote.